Hundreds of swimmers fled to safety after a large shark was seen in the shallows of a popular Coromandel beach. Matarangi Beach was left nearly deserted yesterday afternoon after locals spotted a large shark among swimmers close to the shore. Matarangi Volunteer Rural Fire chief Stu Arnold said rather than risk a shark attack, a decision was made to warn everyone at the beach about the sighting. “It’s better to be safe than sorry. “We have got a four wheel drive motor bike and we just started to patrol up and down the beach telling people a large shark had been sighted at Ocean Close,” said Arnold. Firefighters used a loudhailer to alert holidaymakers about the shark. He said most heeded the warning and left the water. The beach was packed at the time as soaring temperatures saw hundreds of families making the most of a fine day on the popular white sand Coromandel beach. Arnold said it was most likely a large bronze whaler shark enjoying the warm sea temperatures. 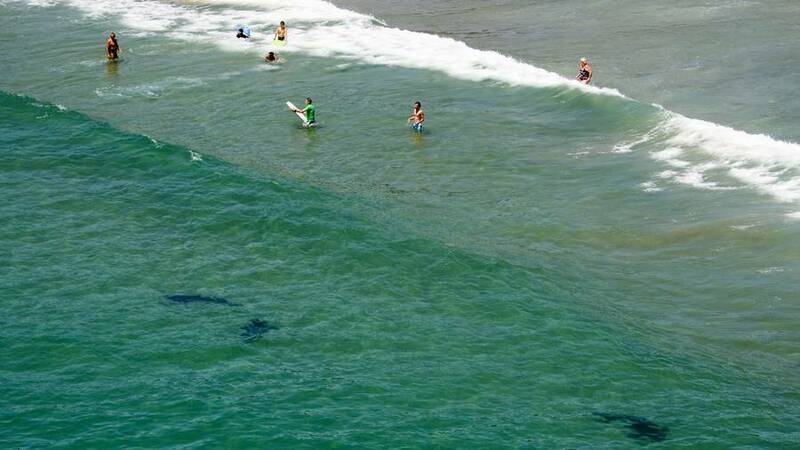 At this stage it wasn’t clear if the shark was still in the area, he said. It’s not the first time sharks have been spotted close to swimmers at Matarangi Beach. Six years ago dozens of sharks were photographed swimming in shallow waters just metres from unsuspecting swimmers.